WARNING: This sh* is addictive as fuh! But seriously you guys, I’m almost nervous to share this recipe with you. 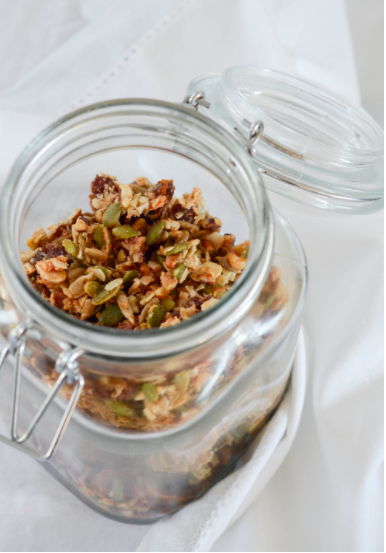 Once you realize how easy, adaptable, and satisfying making granola at home is, it will be hard to stop. 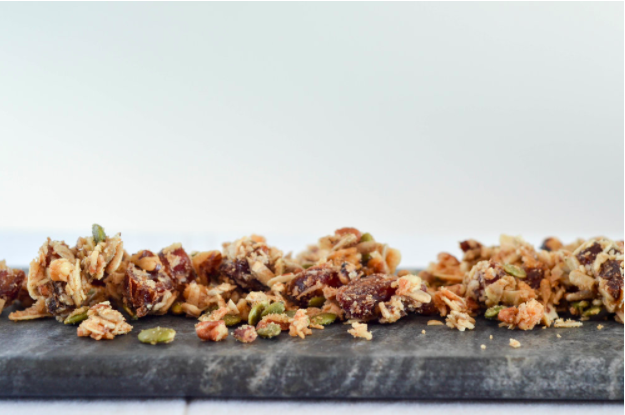 Below is my basic grain-free granola recipe. But like all things, I highly encourage you to make it your own! Try honey instead of maple syrup for a gooier texture (maple syrup makes it a bit more crumbly). You can even play around with a combo of the two! Preheat oven to 275F and line a baking sheet with parchment paper. 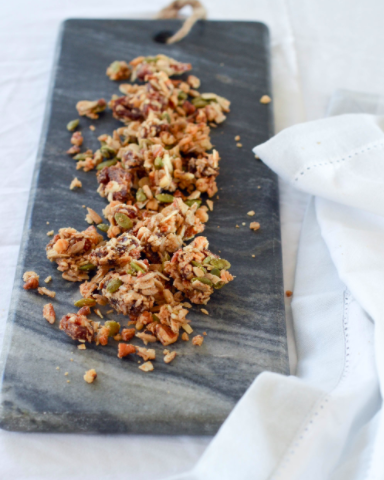 In a large bowl, combine nuts, seeds, shredded coconut, chopped dates, and sea salt. In a small saucepan over low heat, melt the coconut oil and combine it with the maple syrup, vanilla, and cinnamon, and poor over the nut and seed mix until everything is thoroughly covered. *At this point you might want to add a teeny bit more coconut oil and/or maple syrup if it’s look too dry, or not everything is coated. Spread the mixture evenly on the baking sheet and bake for about 25 minutes until you see some of the nuts start to turn a light golden brown. *Make sure not to overcook though! It will still be a bit “wet” feeling. This is normal. Let the granola cool on the pan until completely hard. Break/crumble into pieces and store in a glass air-tight jar.